Crab Spider Visiting New Malden. I think he is from Texas. Over the last few years I have become more cogniscent with nature and insects due to the interest from my 12 year old. Sitting in the garden last week I saw what I thought was a piece of paper or rubbish in the plant pot that is filled with bright blue and yellow pansies and reed type leaves. On closer inspection it was moving and had legs. Quick rush to get camera with Macro lens attached. Told 12-year-old when she got home and cue excitement and Google searches. No doubt it was a Crab Spider. Now this must be a particularly stupid one as one of their attributes, other than that they resemble a crab, is that they change colour and can camouflage themselves. Considering the pot is filled with bright blue and yellow pansies and green reed type leaves, said Crab Spider did not do a good job being bright white. Few facts about Crab Spiders. Crab spiders (Thomisidae) resemble crabs. Their first four legs extend out to the sides and are longer than the back four legs. Crab spiders are almost always found outdoors. They do not make a web; instead they catch their prey using their front legs. The crab spider can stay in the same place—a flower or a leaf, for instance—for days, or even weeks, waiting for its dinner to arrive. The good news for me is that the spider is not poisonous, well to me at least, and lives worldwide especially in North America. We recently had a Texan visitor so I am blaming him as all sorts of strange things come from Texas, and most things seem dangerous and poisonous there! This spider has very strong front legs, and it uses them to wrap its prey. The spider then injects venom into the prey to immobilize it. It eats insects and bees. This is bad news for the many Bees that live in our garden. Crab spiders are reminiscent of water crabs in both shape and movement. They can walk forwards, sideways or even backwards. Crab spiders range in color from pale yellow to white or green. 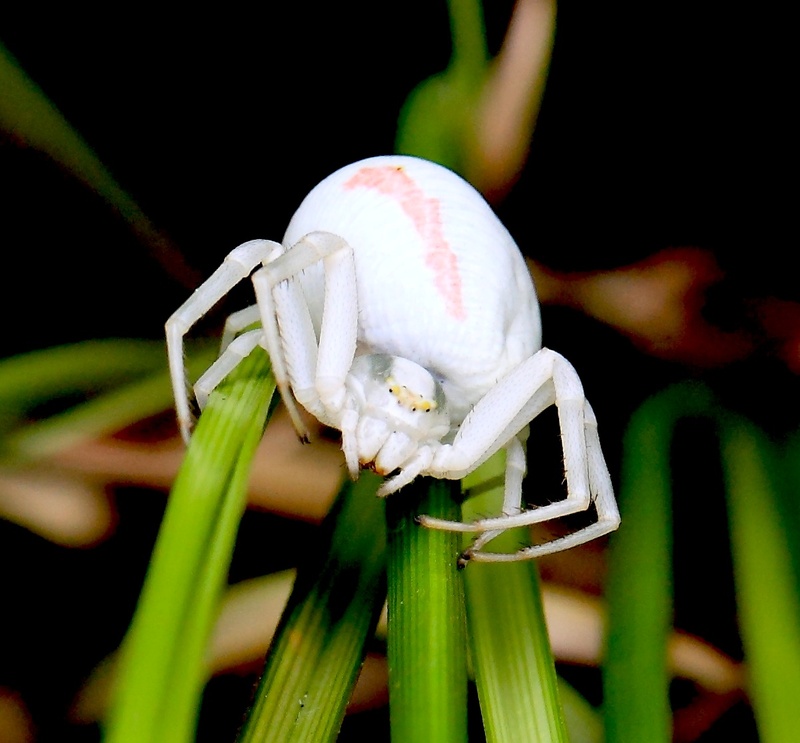 They change their color to match their background, so you may have to observe a flower or leaf for a long time to be able to detect a crab spider sitting on it. Goldenrod crab spiders can change their color to match the flower they are sitting on. It takes about 10-25 days for the goldenrod crab species to change its color to match the flower it sits on. So lets see what our little specimen manages to do in the most few weeks. The good news otherwise for Crab Spiders is that they do live 2 years! Doing a search on Google images, there are many different types of Crab Spider but this one most definitely is one!